See how the NXT Solution Line™ by Blackbaud is helping nonprofits achieve greater results. Learn more about the first-of-its-kind cloud fundraising and relationship management solution, Raiser’s Edge NXT, and accounting solution, Financial Edge NXT. 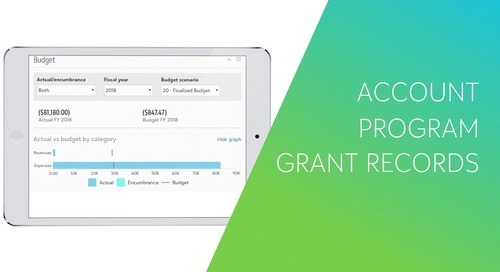 Management of Complex Grants Can Be Easier. See How. With Blackbaud solutions like Raiser's Edge NXT, the Foundation has the instant, reliable data it needs to streamline processes, raise more money, and better support its students and community. In this video, Executive Director Krista Linklater discusses how the NXT Solutions Line has helped the Foundation remain transparent and accountable to donors. Discover how Kids in Distress is using Blackbaud’s integrated solutions to make smart financial decisions and connect with more donors through peer-to-peer fundraising. Association of South Central Oklahoma Governments' (ASCOG) staff members simplified and streamlined their financial processes with Financial Edge NXT. Find out how in this customer story video. In the world of nonprofits, there is never enough time or money to go around. At Blackbaud, we've created solutions to help nonprofit organizations get more out of these two key resources. Financial Edge™ is simply unmatched by any other nonprofit accounting software when it comes to building trustworthy, accurate reports. Why's that? Because it's user friendly.